I’m going to the Northern Warlords GT at the beginning of September, which is one of the bigger and more competitive GT’s in the UK (so I’m told – I’ve never been before). I’m expecting all sorts of “filth”, and I need to prepare. My list as it stands can deal with most “conventional” lists. By that I mean the sort of list you might see at your local FLGS, or of an evening at your local club. I don’t really fear anything in power armour (podding wolves being an exception), nor really guard. Flyers no longer worry me, and I’ve learned to deal with demon FMC spam (still a tough game though). However, I'm an avid follower of 40k podcasts. I listen to them when I run, and when I’m painting (sadly too much of the latter recently and not enough of the former !). One of the reasons I listen so avidly is to get a feel for the current “meta” and what people are taking to tournaments. I’m becoming concerned with the super durable units I’m hearing about, which some are suggesting are specifically designed as “Tau Hunters”. However, I think I’ve come up with a plan, and I thought I would throw it out there for discussion. Had a great day of gaming at the non-club. Sixteen people came along, about as many as we can comfortably handle in the area we have. I thoroughly enjoy these days. While we run a swiss paring system, they are deliberately non competitive. We had some pretty dedicated tournament players (2 who made the GT final last year), some lovely armies (my brothers Necrons in particular deserve a shout out), and some youngsters as well (one of the guys 10 year old son took part in his first event). The spread of armies was also interesting - going by primary detachment only there were 5 Tau (!) Cadres, one Necron Dynasty, a Demon Horde, 3 Craftworld forces, a detachment of Death Wing, some Ravenwing, a Sisters force, a Company of Space Marines, some Black Templars and a detachment of Chaos Space Marines. 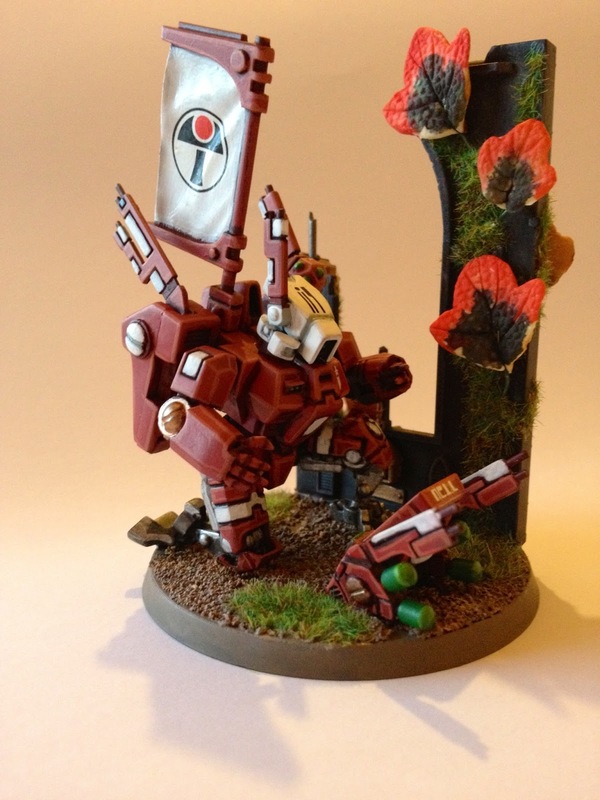 I miss the days when I was the only Tau player at tournaments! I’m trying to settle on a list for the Warrington GT at the beginning of September. As part of that prep the non-club is hosting a day of gaming tomorrow. Three games over the day with 16 people coming along. The first game is a random draw, but after that we swiss pair. While we try and making these days reasonably relaxed, it’s a pretty competitive bunch that come along. Most of them are regular tourney goers and standards are reasonably high. I am planning to write a review of the Farsight supplement, but I’m struggling - specifically, I’m struggling with the way it interacts with a Codex army when allied. I’m horribly confused! Any Character in your army that may select Signature Systems may not select from those listed in Codex: Tau Empire, but may instead select from the Signature Systems of the Farsight Enclave. So, on the face of it it’s quite clear. Army is defined in the rules as including both your primary and secondary detachment. So, if you take either a primary or an allied detachment from the Farsight Supplement, then you can only take the Farsight Signature Systems, even if you take a Codex force either as an allied or a primary detachment. So if “army” includes both primary and allied detachments, does this mean that I can take a minimum Farsight allied detachment (a Fireblade and one unit of Kroot) and then all XV8s in my primary Codex detachment are scoring? That doesn’t seem right. So does “Farsight Enclave Army” really mean Farsight Enclave Detachment”? Any Character in your [Farsight Enclave Detachment] that may select Signature Systems may not select from those listed in Codex: Tau Empire, but may instead select from the Signature Systems of the Farsight Enclave.